Rhesus macaque IGFBP-1, His Tag (IG1-C52H1) is expressed from human 293 cells (HEK293). It contains AA Ala 48 - Asn 281 (Accession # XP_001085935.2). The protein has a calculated MW of 27.2 kDa. The protein migrates as 35 kDa under reducing (R) condition (SDS-PAGE). Rhesus macaque IGFBP-1, His Tag on SDS-PAGE under reducing (R) condition. The gel was stained overnight with Coomassie Blue. The purity of the protein is greater than 98%. Immobilized Human IGF-I, Fc Tag (Cat. No. 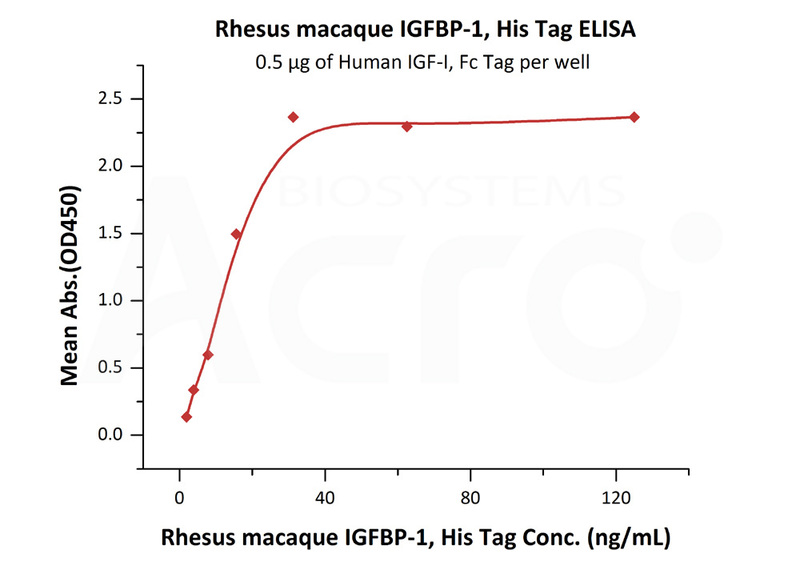 IG1-H4269) at 5 μg/mL (100 μL/well) can bind Rhesus macaque IGFBP-1, His Tag (Cat. No. IG1-C52H1) with a linear range of 2-31 ng/mL (QC tested). 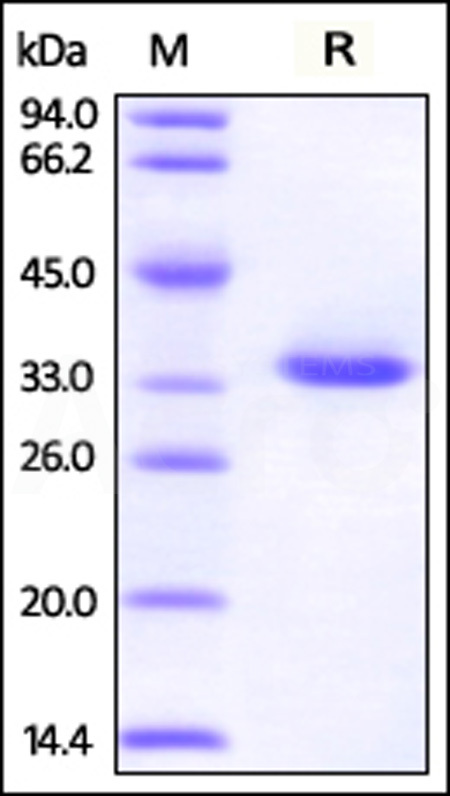 Insulin-like growth factor-binding protein 1 (IGFBP1) is also known as placental protein 12 (PP12), which contains oneIGFBP N-terminal domain and one thyroglobulin type-1 domain. IGFBP1 can bindd both insulin-like growth factors (IGFs) I and II and circulates in the plasma. Binding of IGFBP1 can prolongd the half-life of the IGFs and alterd their interaction with cell surface receptors. Furthermore, IGFBP1 can promote cell migration. Alternate transcriptional splice variants, encoding different isoforms, have been characterized. (1) Lee Y.-L., et al., 1988, Mol. Endocrinol. 2:404-411. (2) Jones J.I., et al., 1993, J. Biol. Chem. 268:1125-1131. (3) Sala A., et al., 2005, J. Biol. Chem. 280:29812-29819.